We all like to take the necessary steps to prepare for big decisions in our lives. You didn't just buy a car or house without the proper preparation and calculation. The same is with starting your own business. It's a huge decision and can be a risk, especially if you are thinking about leaving a comfortable corporate job with a 401k, benefits and a salary for the unknown waters of entrepreneurship. There are things that need to be planned for, thought out and taken into consideration before you jump in full steam ahead. 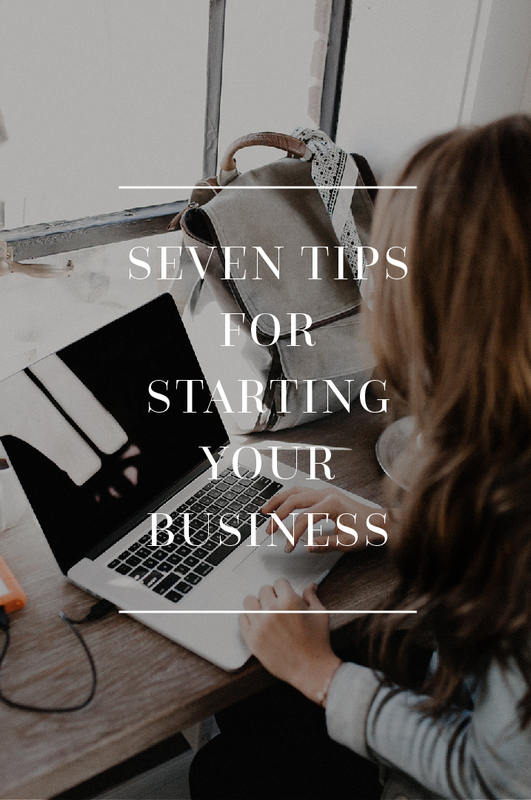 So today, I am sharing seven things that I did before launching my business that helped to set myself up for success, and I'm hoping that they will help those of you that are wanting to take the leap also! This is what I like to say separates the hobby from the full-time business. It is so important to do the math before you start a business, especially if it's going to be a full-time gig that your family is going to depend on. You might need to immediately start making enough to replace the income you are leaving, depending on your situation. Or you may be able to give yourself time to work up to that point. Either way, you need to do the numbers on how much you need to sell and how many clients you need to bring in order to get yourself to your goal amount. When I was planning to launch, I was so confused about how to price my packages. This is something that I see all the time. People have no idea how to price their services and products. Tara Gentile has a great email series called Pricing for Growth that I completely soaked up and put to work. Everyone and every situation is different, so it's really hard to give advice on exact dollar amounts, but below I've included some numbers that may help you calculate how much you need to bring in, and ultimately how much you need to price. How many hours are you realistically wanting to work a day? - Do you have a specific time that you want to stop working every day to spend with your family? Are you needing to be off several days to be with your kids? Are you wanting to be efficient with your time and get your work done during your most productive hours of the day? Etc. How many projects can you work on at one time? - We all know our limits, and if you're looking to own your business, you are probably looking for some flexibility and freedom, so don't overcommit yourself right off the bat. Your goal is to have more time for the things you love, so be sure to be realistic in your numbers. What price can you realistically charge in your first few months of business and how are you going to raise those prices as you get more experience and expertise under your belt? - When I first started my business as a side hustle, I pulled a number that I felt was good enough for someone to hire me. That number was $100 for a logo design. Obviously now that I look back, that was a complete steal, but it was a starting place and allowed me to get a few logos done and on my portfolio, so that I could then build and grow. All you need is a starting place, not your ultimate price. What expenses do you already know you are going to have to pay for every month/year? - These can include software, subscriptions, supplies, employees, taxes, etc. These could also include monthly bills and utilities if you are the main bread winner. When are you going to start taking out a salary for yourself and how are you going to do that? - This is different for every single entrepreneur. Some plan to take out a paycheck right off the bat. Some want to get a good footing before taking money out of their business. This really depends on your situation, but your goal is obviously to make money and pay yourself as you grow, so be sure to not be too cautious that you go months or years without paying for your work. The Being Boss girls have the “Chalkboard Method” that was extremely helpful to me when I first started out. I have since morphed into my own system and process, but it was a great jumping off point. I’m a very cautious risk taker and plan everything down to almost the minute detail, so I am constantly journaling ideas and making plans before I make any decisions. I had already thought out all the back end pieces of my business, like my name, mission statement, if I would be an LLC, etc and all of the numbers above at least 6 months before I had even planned to launch out on my own, and I was so glad I had, because in my case, the opportunity to launch full time came as a God-given surprise. Of course, I'm not saying that you have to plan everything out to the tee like I did, but to have a general plan of what you are going to do, how you are going to do it, who you are going to reach and what your life is going to look like when it happens. My first day of running my own business consisted of sitting at my desk dazed and full of butterflies, because this thing that I had dreamed about and planned so much for had finally come to fruition, and now I had no idea what to do now. Thankfully, I had a google doc ready to go with steps that I needed to take to start getting my business going, like making a list of potential clients, of supplies I needed to get, of software I needed to look into, and of edits I needed to make to my website. A really good resource that I wish I had when I first started is the book Traction. It is basically a guide to building a successful business and has so much wisdom for small business owners as well as a proven plan to go by. I also purchased “powersheets” from Cultivate What Matters the first day of being on my own. It is a planner that helps you break down lofty goals into bite-sized tasks that help with productivity and action. Most entrepreneurs that you talk to started their business as a side hustle for a year or two before officially launching it full time. A lot of people will say that is a wise decision to get a feel for the industry and market, test a few different ideas, and solidify your pricing, packaging and experience before making it your full time job. That's what I did. While working full time, I worked nights and weekends on side projects to make sure that small business logo design and branding was really something that I a) wanted to do as my full time job and b) could sustain long term. Of course, there are the select few that knew exactly what they were going to do, built a platform and audience and launched their business without it being a side gig first, and that's amazing and works perfectly for them. So feel out your business and your personality, if you aren't much of a risk taker, like me, then test your plan before you launch fully for a few months or even a year before hand, but if you know your plan will work and are willing to jump in head first, then more power to you! I started an etsy store a few years ago and before I had even made a sale, I got overly excited and went onto uline.com and purchased a few hundred really nice flat-lay envelopes for my prints to be mailed in. Well, I'm sure you can guess that I didn't use many of those envelopes before I decided that etsy wasn't for me and closed up shop just a few months later. I definitely learned my lesson, after I had about 2/3rds of really nice envelopes left and nothing to do with them. Having made that mistake with my etsy shop, I decided to be a little more calculated and careful when I went to start my branding business. I made a list of the supplies I absolutely needed to have to start taking clients immediately. Thankfully, I already had a handful of clients in the pipeline when I launched out on my own, but things like my old laptop from college and CS4 adobe creative suite just wasn’t going to cut it. So I made the proper investments in a new laptop and the software I needed to begin. Then down the road, I invested in things like packaging, office supplies, an ipad, etc as I started bringing in money. Going out on your own is super scary while also being very exciting, and it’s nice to have a group of people to bounce ideas off of and ask for feedback, especially when they are business owners who have already been there done that. It's always wise to have a group of people who will support you, encourage you, lend advice, and send people your way. Find yours! I have a small group of business owners and entrepreneurs here in Tulsa called "Tuesdays Together" that I was able to talk to and ask questions before I launched out on my own. I also have an amazing community of friends who are constantly sharing my name and my work with people they know and I've had a steady inflow of referrals thanks to them. So empower and equip your closest friends, and find a group of like-minded business owners who can mentor you through the hard parts of owning a business. It’s easy to start your business with expectations that you get from other people on instagram and facebook. There are people who are insta famous and it seems like it happened overnight. You think “why can’t I have 50 clients like this person? Or why can’t I make six figures like her? When you do that you are comparing your beginning to someone else’s middle or end, where you have no idea all that went into them getting to where they are now. Instagram doesn't show the sleepless nights, worry, hard work, and sweat that went into the images of success that many people show. So stay in your lane and use those people as encouragement and inspiration instead of comparison. I'll be honest, I had to unfollow some very talented and inspiring designers, because I was catching myself comparing my business and where I was at to theirs. If you can't get past the negative feelings of comparison, unfollow those people for awhile. It may do you some good to not see their posts on a daily basis. And when you are feeling more confident in yourself and your business, feel free to refollow them later. It’s super easy to put all these plans together and then when you officially launch, reality hits and all your well-made plans go down the drain. It happens and none of us can control that. So always, always give yourself grace. Starting a business is hard and takes a lot of work. I encourage you to celebrate each of your wins (even if they seem small) and appreciate each step you are in! Progress, not perfection, right?! The beauty about owning your own business is that you are accountable to you and no one else (well, maybe your family or spouse if they are dependent upon your income), but that means that you can be flexible. You can work more or less when it's needed. You can tweak ideas and offerings when something seems off. And you can completely change your mind when you need to, without jumping through the corporate hoops. You are your own boss, and you make the rules. These seven tips helped me be confident in myself and my decision, be organized, and be prepared for all the things that come with starting a business. I hope they help those of you who are dreaming of starting. And to those who have already created a business that they love, what are some other tips that you would give to those dreamers? let me know in the comments! If you aren't happy with your current brand and would like to work together, I would be thrilled! Let's Get Started today!